Yes, that ACE Chemicals logo ties to the Gotham storyline, specifically the Joker. According to the DC story, the Joker fell into a vat of chemical solution at ACE and transformed into the villain we know and love to hate today. The ACE logo was shown during Shazam!‘s warehouse scene, when Billy and Freddy tried to figure out the extent of Billy’s new powers. Some fans replied to the original tweet saying they missed this particular Easter egg when watching the movie. Another tie to the DCEU is where the empty warehouse was filmed. According to ScreenRant, they used the Hearn Generating Station outside of Toronto — the same location used for ACE Chemicals during Suicide Squad. Since David F. Sandberg pointed out the Easter egg himself, he probably hoped some fans would put the pieces together, even if it took multiple viewings. The director has been sharing little Easter eggs for the past year, long before the movie even opened — including nods to Man of Steel, and a copy of The Daily Planet in Freddy’s room, with a report on Lex Luthor. As you probably know by now, Shazam! had originally hoped for a cameo from the DCEU’s current Superman, Henry Cavill, but scheduling issues got in the way. Shazam! still managed to include a version of its intended scene, in honor of superhero-obsessed Freddy. You might consider the Shazam! director’s own cameo in the movie an Easter egg, since it’s not at all obvious. Shazam! is a movie that lends itself to repeat viewing, and also post-viewing research. For example, here’s some help deciphering the end credits scene. And don’t forget how all of this ties into Dwayne “The Rock” Johnson’s Black Adam movie, which he said would start filming in about a year. 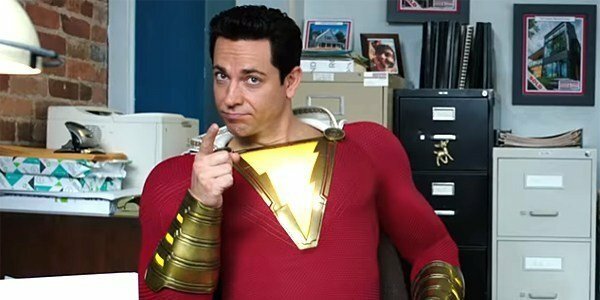 The producers said they will probably move pretty quickly on a sequel to Shazam! and not just because of fan demand. Shazam! is owning April so far, but don’t forget (as if you would) Avengers: Endgame is coming April 26. Keep up with everything headed to the big screen with our 2019 movie release date schedule.